A familiar and well respected name in Melbourne’s Port Phillip property scene, Sarah is well versed in all aspects of the real estate business. Delivering outstanding customer service is her number one priority. It is her clear intention to ensure every campaign is run as smoothly as possible. No two marketing campaigns are identical so it is Sarah’s aim to personalise the experience, treating every sale individually. A highly organised, determined and hard working person, Sarah is also very approachable and empathetic to her client’s requirements at a time that is often very stressful. She understands they are making some of the biggest financial decisions of their lives. Building relationships with her clients and seeing them achieve their real estate dreams is the aspect of real estate that she finds most rewarding. 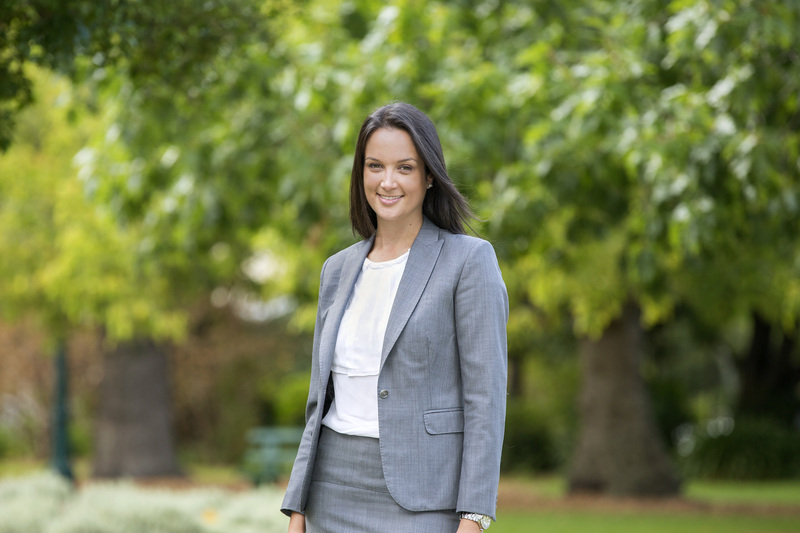 Sarah grew up in leafy Camberwell, attended Strathcona Baptist Girls Grammar school followed by University at Swinburne where she completed a Bachelor of Business Marketing. These days she is a proud home owner in Middle Park where she enjoys sampling the many new cafes and restaurants that seem to crop up daily. We were very fortunate in our choice of Sarah and her team Marshall White to sell our family home in Brighton. Sarah is the consummate professional; she is incredibly knowledgeable about sales the area, offered excellent advise (which thankfully I listened too), and at the same time was attentive to our needs and wishes, and she remained clam and clear-headed under some very stressful moments. The net result of Sarah’s professionalism was that the house sold for more than $500,000 above its reserve price. I cannot recommend Sarah and her team highly enough and the best advise I can anyone selling their home is to choose Sarah and let her get on with it. She is terrific. We have been so fortunate in having Sarah as our agent assisting us in the recent sale of our house in Cruikshank Street, Port Melbourne. From the first time we met her, we were struck by her energy, dedication and total professionalism. Sarah has great empathy with her clients and kept us completely up-to-date with all the potential buyers and interested parties who walked through our gate throughout the whole campaign. Importantly she guided us and ensured our expectations were realistic. We believe Sarah is thorough and honest in her dealings with all parties and her advice and opinions we greatly appreciated. In the end Sarah went that extra mile in securing our sale. Her engaging and positive manner was so refreshing. We would highly recommend Sarah to anyone seeking to sell their property. Sarah Wood was the agent at Marshall White who looked after the sale of my property in Port Melbourne. During the sale process I was living in London which obviously presented a few challenges in terms of communication and the time difference. Working with Sarah was an absolute pleasure. She is extremely professional and very organised. She is also a woman of her word – if Sarah says something will happen by a certain date it does. Her communication was regular and very clear. She takes the time to explain her approach and rationale on all key decisions. Her thought process is always very clear and logical. Sarah is the opposite of every real estate agent cliché you have ever heard! I was extremely impressed by Sarah’s ability to analyse the market and my property’s position within it and develop a clear strategy. This became particularly evident once the open houses began as she clearly analysed all key potential buyers. Her knowledge and recommendations were canny and clear. I followed Sarah’s advice through the entire process as I believed she was clearly an expert in her field. I am delighted to say that following that advice resulted in a sale price with which I was delighted. Considering I lived on the other side of the world during the entire process I found it all very easy and without stress – mostly because I completely trusted Sarah and she never gave me any reason to question that trust. I cannot recommend Sarah highly enough and will be recommending her to friends and family! Dear Sarah, We would like you and Marshall White to know how impressed and delighted we were by the efforts you made to achieve the best outcome on the sale of our property. We could not have hoped for more courteous, professional and thorough service. It began with the advice we received from you and from Scott Mollard about the preparation of our house for sale. Although this involved considerable cost, we have no doubt we recovered that cost 'in spades'. You then made yourself thoroughly familiar with the circumstances of every attendee at our opens who had expressed any interest in the property and, so far as we could observe, kept in touch with them to maintain their interest. The result was a very well attended auction and a price that exceeded our expectations. You were always a delight to deal with, Sarah, and your calm demeanour soothed our jangled nerves in the weeks leading up to the auction and on auction day! Our decision to engage Marshall White to sell our property was the result of the positive experience friends and other family members have had with you and your excellent reputation. Your work on our behalf has enhanced the high regard in which we hold you and we would not hesitate to recommend you personally, and Marshall White generally, to anyone thinking of selling property. Thank you again, Sarah, for an outstanding job. Early this year, we made the big decision to sell our family home in Port Melbourne. While our home had been tenanted for the past three years through Marshall White, it still felt like our family home. We engaged Sarah Wood of Marshall White to talk through the sales process, including minimizing any potential disruption to our tenants. Sarah was an absolute pleasure to work with. We worked together on what the sales process and campaign could look like, she took the time to ensure that everything was extremely well planned and organized. From the outset, Sarah helped us understand the market, helped set realistic expectations and walked us through what would occur as part of the sales campaign. We put our trust in Sarah and she delivered. She provided guidance on the right time to conduct the auction, identified realistic price ranges, and ran an active and professional campaign – right down to the final negotiations on the auction day. We also purchased a new home around the same time, and Sarah’s advice and guidance was incredibly helpful. She helped give us confidence that we had made the right decision. We would happily use Sarah again. In particular, Sarah stood out in providing: - Excellent expertise and guidance. Given the fluctuation in the property market, Sarah helped set the right market expectations and provided a realistic price range for our property. She knew the market inside out and Sarah’s guidance throughout the sales campaign and purchasing our new home was reassuring. - Outstanding customer service and focus. Sarah provided proactive updates from house inspections, identified potential purchasers, and always answered questions promptly. - Guidance and management of the existing tenants. Sarah built a good relationship with the tenants and worked to ensure that their expectations were also met. This meant that the tenants were accommodating and worked with us to ensure a successful campaign, for which we were grateful. We were pleased to achieve a great result on the auction day as a result of a smooth and professional campaign. Our thanks go to Sarah and the Marshall White team for managing every aspect professionally. We can’t advocate for Sarah and the team more highly.